Procrastination: that vexing time thief so many gifted children face. You watch as your bright, curious child, passionately engaged in so many interests, comes to a screeching halt when a project is due. You coax, cajole, demand, bribe, threaten, and stand on your head, yet nothing will budge. What gives? While most people procrastinate from time to time, some develop a chronic pattern fraught with avoidance, disorganization and frantic efforts as deadlines loom. Before you nag your child one more time, rush out and buy yet another self-help book, or hit your head against the wall, you may first want to sort out the reasons for the procrastination. Usually there are one or more contributing factors, and if you sort these out, you may be better prepared to tackle the problem. 1. Distractibility - Some gifted children are so immersed in their interests that they have difficulty focusing on the task at hand. They become easily distracted by more engaging ideas or projects. Overscheduling can exacerbate this problem; however, distractions can arise even without competing demands once the child's passions and interests take hold. 2. Disorganization - Gifted children can struggle with poor organizational and planning abilities and can lack time management skills. Despite motivation to complete a project, they may become overwhelmed when it involves more attention to details or long-range planning than usual. Difficulty managing their time and structuring how they will work is frequently the root of this problem. 3. 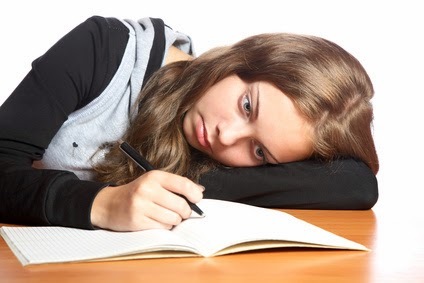 Apathy - Sometimes gifted children have become so bored and disgusted with school that they lose interest and don’t really care about the quality of their work. They delay completing assignments because the work seems meaningless. They would rather engage in a multitude of other activities than “waste” their time on rote paperwork or assignments that seem too easy. 4. Past success - Some gifted children procrastinate because they can get away with it. Many have learned that completing assignments at the last minute does not diminish the quality of their work or harm the outcome. They know they can do better, but with a track record of excellent grades behind them, they realize they don’t have to work very hard to just slide by. 5. Rebellion - Procrastination can be an expression of resistance or quiet rebellion against completing an assignment a child resents. It is a means of devaluing the project, minimizing its importance, and expressing anger about having to work on something unappealing. Even if the project is eventually completed, delaying it until the last minute is a form of silent protest that may feel empowering to the child. 6. Perfectionism - High expectations of achieving success can create anxiety and a desire to delay that which is distressing. When gifted children worry that they might not excel on a given task, they may put it off until the last possible minute. Clearly, this can be a recipe for increased anxiety and inevitable 11:00 PM melt-downs. 7. Self-sabotage - Some gifted children (and gifted adolescents in particular) try to hide their abilities from others. In an attempt to blend in, they may disguise their talents, perform poorly, and disengage from academics. Procrastination may reflect their ambivalence about confronting this dilemma and uncertainty about whether to minimize their abilities or live up to their potential. And if the quality of their work suffers, then they can perpetuate the image they want to convey. 8. Insecurity - Despite their apparent skills, some gifted children doubt their abilities. They may feel like "imposters" and worry that their inadequacies will be "discovered" at any time. They believe that they have an image to uphold and if they fail in some manner, they will be outed as a fraud. Delaying completion of a project is a means of avoiding the inevitable anxiety that arises when they confront this fear. 9. Shame - Along with insecurity, some gifted children experience feelings of shame if they fail to excel. They react as if this is an indictment against their intelligence and suspect that others will view them as inadequate. As a result, procrastination can be an excuse; if a less than perfect grade is attributed to a rushed, last-minute effort, then the child can believe that actual ability was never to blame. 10. Depression - Occasionally, procrastination may be a symptom of depression. However, it usually coincides with other signs, such as withdrawal and isolation from peers, apparent sadness, changes in eating and sleeping patterns, and irritability. In these situations, procrastination may be a reflection of feelings of hopelessness and a perception that school work lacks any meaning. Sorting out the cause of your child's procrastination is the first step toward working on the problem. A one-size-fits-all approach based on the latest self-help ideas may not work for your child's specific situation. Clearly, a child whose procrastination is the result of perfectionism and shame will need a different approach than one whose primary concern is apathy. Let us know what you think about procrastination in the comments section below. This is brilliant, thank you. This is SO my nearly 11 year old son and I've never thought about it this way before. Thank you for this article! As a child, I was identified as "gifted" and I can relate to every single reason you posed here. I still have issues with procrastination for some of these same reasons. I hope that somehow we can start to train children that have been labeled as "gifted" to handle the issues that come along hand in hand with said label. I'm still learning...it's been a long road! Thanks. I think these kids can become "gifted" at procrastinating, just like everything else! There are many reasons for procrastination, and it is such a challenge that robs them of their potential. I agree...it is a long road. I think that is the true issue. If Academics aren't a challenge, then figuring out how to procrastinate surely is. Over achievers will over achieve at anything that our children, or us are told we can't do, including the proof that we have the ability to do nothing at all. You hit the nail on the head. I was labeled gifted as a child. I suffered from procrastination and still find I use it too often as an adult. Your article has helped me discover that I have used all of these excuses at one time or another to avoid projects. I will be more mindful now when I notice I am procrastinating and try to get to the root cause. Hopefully this will lead e to be more successful in my approach. Thank you. I agree that being as aware as possible can certainly help. We can also be better role models for our children when we address our own procrastination dilemmas. I know that my procrastination can take many forms, and is still and ongoing challenge at times! Thanks for sharing. I think another reason the gifted child procrastinates is to created a challenge for herself where there otherwise may not be one. My daughter is a junior and she is forever leaving all her homework for the last minute because she says she works better when there is the pressure of getting it done in a short period of time. Great point about last minute pressure. A lot of people claim they work best and thrive with the adrenaline of last minute pressure. Ultimately, there is a price that can be paid in terms of stress, let alone lost productivity when that is the only means of getting it done. Some gifted kids have been so bored that the only way they can insert energy and excitement into their work is through creating artificial deadlines and pressure. As a gifted child that's now an adult, I tend to procrastinate at work specifically because I know I can get the work done fast and don't want more work given to me. I pace myself and putz around until whatever is done in the same amount of time as the next person doing it. It's a form of #7 that I started in high school - I wanted to finish my work in the same amount of time as my friends, especially if we work working on it together. This discribes me so well! It was true in my childhood, and remains true in adulthood. I just hope I can help my son work through these issues, so he doesn't become a chronic underachiever, like me. Amy, Good luck with your efforts. Anonymous, Wow, it sounds like you have lots of energy to burn. Good for you. Wonderfully insightful! There are sometimes physical ailments that contribute as well. Low thyroid and adrenal fatigue make it hard to 'git er done' so a student will use the threat of a deadline to allow the fight or flight response to kick in an push them. Loved your article. Interesting point. Your comment about physical problems also suggests the need for pacing based on energy level, alertness, and awareness of when one is most productive. All of these can certainly enhance or interfere with completing work. Thanks. So easy to get pulled in a million directions. Good luck with this. Doesn't this describe anyone who procrastinates, gifted or no? You are right - many of these can describe anyone. However, some of them apply more to gifted individuals. For example, those who are not gifted may feel less pressure to "blend in" so their abilities are not noticed by peers, or may not feel they have to live up to others' expectations of perfection. Those who are not gifted also procrastinate; their composite list of precipitating factors would be somewhat different. I am struggling with getting help from my daughters school! They know that she is ahead of her peers and yet getting D's and F's is ok to them. They tell me that its behavioral and will not help me to get her on track. She always has missing and incomplete assignments. She can't focus and is easily distracted. She keeps falling farther and farther behind. I was just like her when I was younger and did not have any parent involvement either. But I strive to stay involved and meet with teachers and counselors all the time. They just keep telling me that I am putting to much pressure on her. I am to negative. Please any help on how to organize and stop the procrastination of my gifted child would be a huge help! With low grades and little help from school, an outside evaluation with a psychologist might be helpful. What do others think? also ive had major depression in the past..
Kyra, I can't really give advice over the internet, but when someone is struggling this much, it is usually a good idea to ask for help from a trusted friend, parent, teacher or other adult. Good luck. I wish my parents had this article when I was growing up. Today, I still struggle with these. Have you blogged about solutions to these issues? If so, I would love to read it. Not yet, but I plan to some time soon. Thanks for asking. Now all this information already. Where is the help? I need help! Anonymous, If you are in need of help with your child, you may want to seek the services of a counselor, school psychologist or therapist. While advice online may be helpful, it can never be a substitute for an individualized approach to your child's specific needs. Good luck. As an additional gifted student that is continuously struggling with the listed reasons, I absolutely loved how relatable this article was. I procrasinate so often that I now have developed numerous skills in the area.At times I find it to be almost game-like, waste time then ultimately rush while fearing devastating failure. The worst part is when I loose this game I get extremely upset. I am aware of the negative aspects of procrasination, but don't seem able to stop. In fact researching academic related topics online or physiological reasons why I procrastinate is my most common way to avoid doing work. Great article. What suggestions do you have for helping a 7 year old gifted boy who over focuses and multitasks, which in turn leads to him being unable to complete a single task on time since he is 'distractable'? Specifically, this is happening in school since he is always paying attention to absolutely everything around him, and is not able to bring his focus back to the task at hand, e.g. completing a written assignment, and the teacher constantly has to help him re-focus (he knows all the content and is not behind in class). Anonymous, I can't offer specific advice over the internet, and even if I could, I wouldn't be able to offer anything comprehensive without knowing your child. However, I can suggest that you look into a few possibilities. Is he bored with the material, since you mentioned he knows all of it? Is this a maturity issue, given his age? Does he need more guidance from the teacher in terms of redirection? Does he get any help with breaking tasks down into smaller parts? He might also benefit from an evaluation to understand more of what might help. Good luck. Gifted individuals who are highly creative tend to take more time to "play" with ideas, decisions, tasks at hand.....which may appear to be procrastination (and it may actually be procrastination, but it is the way some of us are wired, part of our personality) .....some people need more time to come to terms with things than others...judging and labeling is harmful....acceptance is a better response. Making a behavior a pathology is harmful. Everyone is not on the same timetable. If students meet true consequences for a behavior, they will learn how to deal with it, on their terms and in their own time. Attempts to fix someone else's "problem" is an insult and sets the stage for the development of low self esteem. Accept the fact that some people (gifted or otherwise) are just DIFFERENT and not defective because they are functioning on their own time table. If their time table is harmful to them, they will learn through natural consequences how to deal with their behavior. Anonymous, Good points about how gifted people often need time to play with ideas. I agree that procrastination is not a pathology; rather, it is a behavior that can reflect underlying concerns for SOME people, although not everyone. Some people who procrastinate do this because of feelings of shame, or perfectionism, or insecurity. These concerns are hurtful for the individual and, in my opinion, would be good to address. On the other hand, sometimes procrastination is just a habit, a means of adrenaline-seeking, a way to rebel, and natural consequences may help to change it. Thanks for your comments. Rachelle, It is certainly possible that it could be related. However, as we know, many who are not gifted also struggle with disorganization. Either way, I hope you and your child are able to get a handle on this. This is great, Gail. Your posts are always so thorough. You make very important points with just a few words. Thank you for caring so deeply and giving freely of your expertise. I have also found that anxiety over judged results can cause a person to procrastinate to the point that they are able to turn in a finished product that they know does not reflect the best work they can do so then the grade and criticism does not as deeply hurt. I think you've missed a very major one. That they actually need a break, but can't recognize that.